Loophole is the collaborative project of sonic artist Micah Henry and visual artist Anna Firth. The traveling show brings animation and experimental music clockwise across British Columbia, Idaho & Washington. 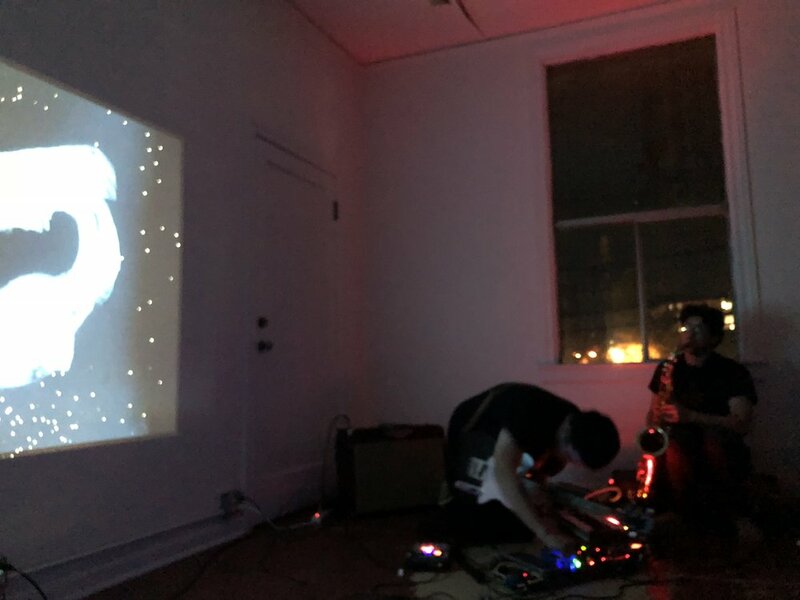 Sharing an interest in loops, the duo brings this perpetual format to the ephemeral spaces of performance venues or locations temporarily functioning as venues. Loophole hybridizes analog and digital technologies and explores real time interactions between sound and visuals. A loophole is unaccounted for exception in set of rules or laws which can be benefitted from in an act of mischief, defiance, or misuse. Perhaps a loophole is a space: a hole or portal which can be stepped into and entered. Loophole’s animations are full of these portals. A sweaty cat is repeatedly drawn to slip into an orifice in its own grave. A rabbit stretches and distorts its body by passing a spatial warp. These cartoonish characters and others hellishly repeat the same gestures in acts of pleasure, amnesia, and indifference.